Slate is a metamorphic stone. If you can remember back to your middle school science class, that means it’s the result of a transformation of pre-existing rock under great pressure and temperature. It’s no secret that interior design trends tip towards stones like quartz and granite these days. However, if you’re looking for something a bit more unconventional—something that stands out—you may want to consider slate. Slate has been used in construction as far back as the Roman Empire. It was considered an easy material to work with because of how easy it can be broken down into thin slabs. Nowadays in the US, slate is mostly used with flooring and flooring applications, it can also be used as a counter-top. (You might be interested to learn that MARBLELIFE has even perfected ways of converting a rough and tumble tile floor into a flat-to-the-grout lines homogenous flat floor with a gorgeous appearance. Check out this west coast project outcome to see what slate can look like in the hands of a craftsman). We don’t usually think of stone as being absorptive. But just like many natural materials, all stones have a characteristic porosity and absorption rate. The water absorption rate of slate is very low, around 0.4 percent. Making it ideal for surfaces in moist environments. To compare, marble can have an absorption rate as high as 2.0 percent. Meaning if you soak it in water it can pick-up 2 per cent by weight. This may not seem important until one considers sensitivity to spills and staining. The correlation is the importance of sealing. The other walk away is that anything over zero means your surface can be stained if not sealed. Slate isn’t as heavy as granite but that bears no weight on its durability. It’s able to withstand blows and strikes from other heavy objects (within reason). And as long as you keep the chisel and hammer away, slate can last for a very long time. This is probably why it’s a popular material for roofing and floors. It is unique is having greater strength in one direction versus another. Easily split into sheets with a chisel, but tough to crack with a direct blow from above (…not put away that sledge hammer lets not get to crazy here). After your professional countertop installation, maintenance of slate is pretty simple. Application of a sealant like MARBLELIFE® Stone Sealer is recommended to further protect this durable stone from any unintended discoloration or staining. Cleaning using a stone-safe cleaner—MARBLELIFE® Marble Cleaner Concentrate or MARBLELIFE Granite & Quartz Cleaner—will keep your slate in prime condition. 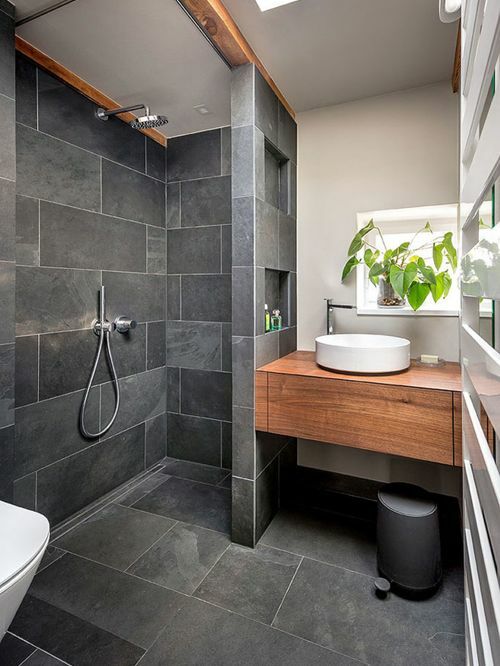 Prefer the deeper, richer look of slate when its wet, talk to MARBLELIFE about having your surface color-enhanced. This treatment will make the wet deep color permanent and can be done in less than a day. PRO TIP: Don’t wipe spills. Blot them. This will reduce the chance of spreading stains. What is on the surface is there because you have already filled in the pores beneath the spill. Our goal is to dab up as much as possible without pushing more into open pores nearby. Once the surface is clear, dab again with a dry cloth as you seek to draw out through the towel’s absorption the spill in the stone. Once done wet the surface and allow to soak for a second. Our goal is to dilute the spill in the pores, then dab it dry again with a dry cloth as we seek to clean the spill, but also draw anything in the stone out again. Once successfully clean….consider yourself lucky…and consider sealing so that you do not risk a stain with the next spill. The dark texture which characterizes slate makes it a great match for modern décor or a rustic look. In spaces with white walls, slate countertops provide a sharp contrast that make it stand out more than materials like marble or quartz. Want the color without the rough tumbled look, not a problem reach out to MARBLELIFE and have them flatter the surface. This is true craftsman work as one need to take off the high areas without carving away the lows, but the result is a flat clean floor with all the beauty and color slate provides. Because of its chemical composition, slate is similar to soapstone or granite in being remarkably heat-resistant. Capable of withstanding more heat than many metals, it’s very unlikely that you’ll damage or discolor this stone with hot items, unless it has been resonated in which case the resination polyester can be charred, as such we still recommend using a trivet. As far as natural stone goes, granite and marble definitely occupy the higher price ranges. Marble, while beautiful can be acid etched making it a great show surface but not a great working surface. Granite is beautiful, hard and heat resistant, unless resonated. Slate offers the color with a more uniform appearance than available with the crystal appearance of granite. However, slate is a natural stone that can add elegance and style to your space without breaking the bank. 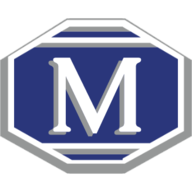 For any other questions regarding slate countertops or any other stone maintenance and care, call your local MARBLELIFE® office (888) 463-2780 and a knowledgeable stone craftsman will be happy to assist you. 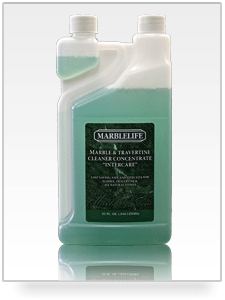 MARBLELIFE(R) Marble Cleaner Concentrate is designed for regular cleaning of marble, granite, travertine, slate, terrazzo, concrete and other types of natural and man-made floors.